Every writer & blogger realized that the BLOGGING is a best profitable platform for making money - blog makes you start a money earning medium from home. Today the question is not "How do I blog? How to start a website?" rather the question is "How do I make extra money online easy & fast through blogging & writing articles?" As a yahoo ads publisher I must say; making quick fast money through blogging requires a carefully best, selected & most blogged writing topics with fresh blog-post ideas which are also relevant to your niche topics. When it comes to making money from a blog, you have many options to earn without Adsense. One of the simplest ways is to place PPC advertisements i.e. bing yahoo ads on your blog, and you will be paid depending on your niche, quality of traffic, and the number of clicks on your ads. We have till now reviewed many contextual ad networks and by comparing google adsense vs bing ads I can say that the Media.net scored as the best network outside of any other PPC Ad Network. And today, therefore, we are going to see the BEST earning program Media.Net: Yahoo! Bing Ad Network for all bloggers. That will make you extra income from the same blog. In the case of media.net vs. Adsense, the estimated revenue generated in bing online advertising is higher than Adsense earnings. Note that the bing and yahoo ads are the same. In bing ads, no minimum traffic requirements, quick payments via PayPal, 100% fill rate, and High CPM ads makes the Media.net best in Ad networking sites. Publishing media.net case study to help to earn more with same content and along with exsisting ad neworks. Check out Best Alternative to Earn EXTRA Money from Blogging. Last time you have seen; 25 Top Mobile Apps That Make You Earn Money & Rewards From Mobile, but today we are going to see, one of the best alternative app to earn money from blogging. Media.net Review for Publishers —it is the best alternative to earn money from blogging & writing articles. In today's days, everyone seems on writing on earning programs, but about Media.net, the case is much different, yahoo bing ads is an excellent contextual based ads display platform that publishers can use on their blogs or website to generate revenue. Meida.net is a contextual ad network, which means that it hosts advertisements based on the context of the page. The Yahoo! Bing Network Contextual Ads program powered by Media.net enables the web and mobile publishers to earn advertising revenue easily and effectively. For example, if you are running Media.net ads on your page about computers, your readers will be seeing advertisements related to computers and its accessories. Similarly, a page about recipes will have ads related to the things which belong to it. Its a contextual ads program; Media.net runs contextualads.yahoo.com exclusively across all markets. As these ads are related to the context of the page, automatically optimized for highest revenue between text and display ads for each impression with a single ad tag. These bing ads or yahoo paid ads actually look the same as the content ads, with one big exception: they are shown to search engine traffic only, and the content of the ad is tied directly to the visitor’s search query. The yahoo advertising deliver higher user engagement with keyword targeted article searches and sponsored ads. 3. Higher bing ads pricing. You will see the decent earnings per click. Media net is offering technology platform, whereas yahoo, bing offers their traffic and search volume to advertisers through media.net. The quality of ads are high, Media.net’s CPC seems to be very similar to AdSense’s. This is probably the biggest reason why Media.net stands out among many other contextual advertising alternatives and also there are various optimization techniques to get more from all of your placed ads from your site. One of the key features of Media.net is the hosting of mobile ads. This feature is currently in beta, but with the growing number of smartphone users, mobile ads are the future of advertising for publishers. Media.net mobile detection technology automatically detects mobile and smartphone browsers and serves mobile ads which will help you to earn additional income. Add custom sized 'in-content' units within the page to ensure a seamless browsing experience. The Yahoo ad network is also known for supporting different types of ad formats like video, images, text and rich media. Now, this ensures that you have the choice of opting for any of these formats as per your content and budget. Media.net’s algorithm for determining relevant bing ads with your content seems to be very strong, and the design of the ads are such that they look like part of your site’s navigation. These bing display ads support all iOS and Android devices, including tablets & iPad. There are very few ad networks offering dedicated account managers, and Media.net is one of them. As soon as you get an approved Media.net account, you will be assigned an account manager, and he will assist you with the setup and help you to get started. Indeed, if you are not a techie who likes to optimize ads (color, text, etc. ), your yahoo ad manager will do this for you. 7. Dynamic optimization between text and display. In comparison with others, Media.Net allows you to have more control on the appearance of ad units; that is dynamic optimization. This feature actually helps the user to optimize between text and display for each and every expression without running separate tags for both. Custom sizes & responsive designs blend in completely with your site's layout, delivering a native ad experience. They allow you to change color, font, and shape of your ad units so that they can better integrate with your website’s design. And moreover; simple implementation with a 2 line JS code. After getting the approval of one of your site, Media.Net allow to serve their ads to all your websites with the same account manager, however, need to get approval for every website, which is easy with the help of site manager. Media.Net is a one of the trusted and highest paying Publisher Ad Network in the Industries. For Alternatives, I will put Media.Net on the TOP because of their dedicated service, Targeted Ads Inventories and good CPC and CPM ads. The Yahoo! Bing Network Contextual Ads program powered by Media.net enables the web and mobile publishers to easily and effectively earn advertising revenue. 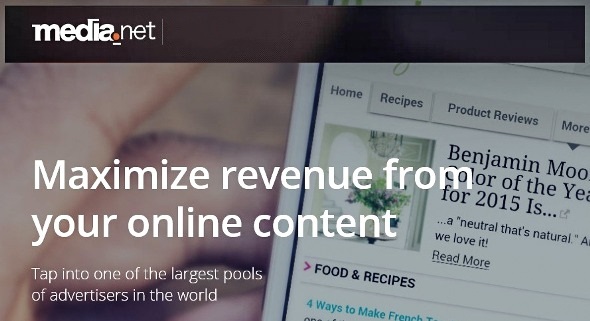 Media.net offers its publishers, a self-serve platform to create bing ppc ads units that display a mix of relevant display and text ads for Desktop and Mobile traffic. What are the requirements for applying in the Media.net? No Traffic Restrictions To Join. Not Allowed: Adult, Illegal Drugs, Tobacco, Ammunition, Alcohol, Gore, Violence, Counterfeit Products, Gambling, Racism, Hazardous Substances, Hate-speech, Racial Intolerance, Prescription Drugs, Pirated Items. Highest eCPM, CPA, CPI, CPL, and CPM pricing rates. A dedicated account manager & Expert team. Fast payments made through a vast selection of methods. $100 by either PayPal, Bank Wire. Recommended to use PayPal especially for India publishers as because the banking charges are more than the charges that with PayPal. What is the best and secure way to receive or transfer or send money online - Payoneer's have best payment program that allows global organizations and provides the flexibility to arrange how to receive their money, by the secure method that best comforts them. It is the global payments payout services money transfer service. Payoneer enables us to receive the money online from all over the world and that is why the Payoneer is the best national/international money transfer service. That is why I want to recommend you to use this secure and best Payoneer system for receiving the payments on the internet. Payoneer is not that much famous & popular like Paypal is but it's the best alternative to Paypal. Payoneer is a fast and easy solution to receiving payments.